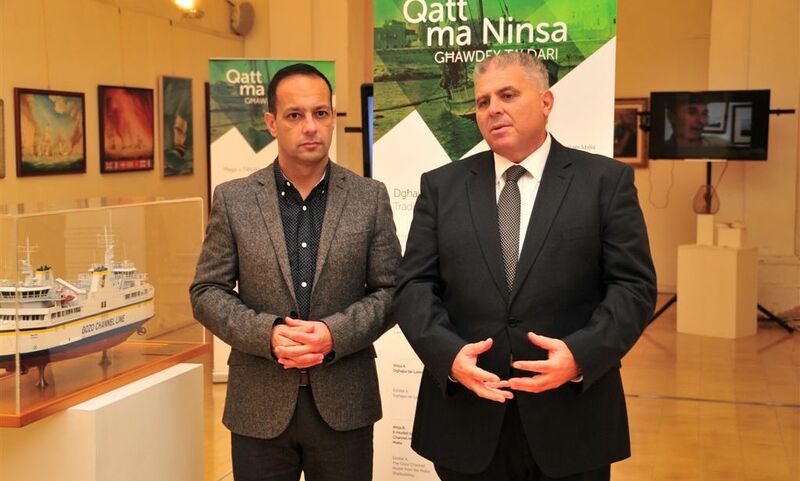 Valletta 2018 Foundation Chairman Jason Micallef together with Gozo Minister Anton Refalo during the launch of Qatt ma Ninsa -Ghawdex ta' Dari. Members from the community are encouraged to bring objects, heirlooms, photographs and recipes with them and share their story or discover their origins during a memory gathering event on Saturday 24th October from 6.30pm onwards and on Sunday 25th October between 9am and 12pm. Valletta 2018 is hosting Qatt ma Ninsa – Għawdex ta’ Dari, a memory gathering project aimed at collecting stories about objects related to Gozitan community life, at Pjazza San Franġisk, Victoria, Gozo, on the 24th and 25th October. Valletta 2018 Chairman Jason Micallef highlighted “By means of this project, which is being organised in preparation for 2018 when Valletta hosts the European Capital of Culture title, we are guaranteeing that this special atmosphere shared by the Gozitan community, will not be lost. This community feeling will contribute to positive changes to Maltese, Mediterranean and European society.” He added that this project was being organised now in light of the Jum Għawdex festivities on Wedesnday 28th October, an occassion in which Gozitans reflect on their past, their story and their identity as well as on future challenges. On Saturday 24th October, festivities for Qatt ma Ninsa open with local Gozitan choral group the Chorus Urbanus at the Ministry for Gozo at 6.30pm. Following this, Gozitan dance company Naupaca Dance Factory will be giving a contemporary dance performance inspired by memories of the Gozitan community. Qatt ma Ninsaincludes an exhibition of models of the dgħajsatal-Latini and the Gozo Ferry – Malita ship, as well as the video series Ħaġa u Taħdita which focuses on the daily lives of people from the Gozitan community. L-Ikla t-Tajba pop-up kitchen will be serving street food with a twist throughout the night. Young people from AġenzijaŻgħażagħ will be preparing food from the pre-war era in light of the event’s relation to the past. A candle memorial will also be organised throughout the night in which a candle is dedicated to Gozitan personalities nominated by several Gozitan local councils. The community is also invited to dedicate a candle to someone important to them, resulting in Pjazza San Franġisk being illuminated by candles. Gozo-based band Cash and Band will also be providing musical entertainment through the night. Members from the community are encouraged to bring objects, heirlooms, photographs and recipes with them and share their story or discover their origins during a memory gathering event. This will continue on Sunday 25th October between 9am and 12pm.